To Cite: Enhesari A, Saied A, Mohammadpoor L, Ayatollahi Mousavi A, Arabnejhad F. Presence or Absence of Palmaris Longus and Fifth Superficial Flexor Digitorum; Is There Any Effect on Median Nerve Surface Area in Wrist Sonography, Iran J Radiol. 2014 ; 11(4):e14441. doi: 10.5812/iranjradiol.14441. Background: Carpal tunnel syndrome (CTS) describes a set of symptoms caused by compression of the median nerve in the wrist, which is the most common site of nerve compression in the upper limb. This syndrome is a primary source of pain and reduced function in these patients, and the cause is compression of the median nerve where it passes beneath the flexor retinaculum in the wrist. 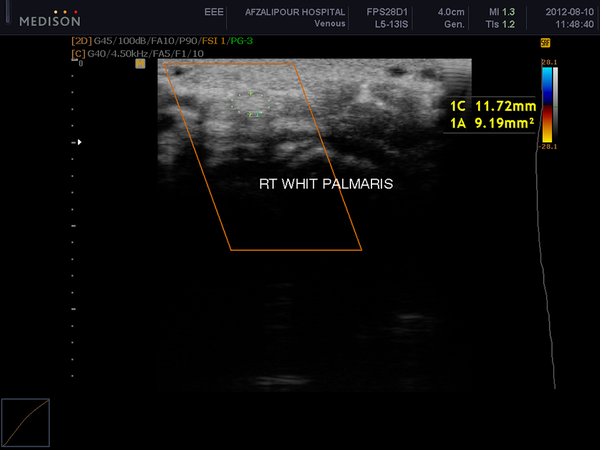 Objectives: The aim of the present cross sectional study is to assess the absence of palmaris longus and fifth superficial flexor digitorum tendon as normal anatomic variations on the sonographic measurement of median nerve surface area in healthy individuals’ wrists. Patients and Methods: Ninety-three healthy volunteers underwent clinical evaluation for determining the presence of tendons in both wrists and sonographic measurement of median nerve surface area. Results: In 41 of 186 (22%) hands, the palmaris longus tendon was absent and absence of the fifth flexor digitorum tendon was noted in eight (4.30 %). The median surface area in the hands without palmaris longus was meaningfully lower than the hands with it (P = 0.025), while the difference in the median surface area was not statistically significant with regard to presence of the fifth flexor digitorum tendon (P = 0.324). Conclusions: Based upon the findings of the present study, it seems that the median surface area as a sonographic finding is probably related to presence or absence of the palmaris longus tendon, so that hands with the tendon present have larger surface areas. In addition, it seems that this sonographic finding does not depend on the function of the fifth superficial flexor digitorum tendon. 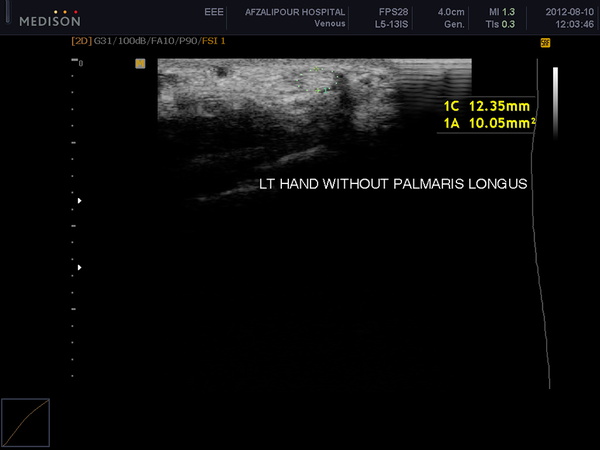 Therefore, no correlation between CTS and the presence of palmaris longus tendon should be observed. Carpal tunnel syndrome (CTS) describes a set of symptoms caused by compression of the median nerve in the wrist, which is the most common site of nerve compression in the upper limb. This syndrome is a primary source of pain and reduced function in these patients, and the cause is compression of the median nerve where it passes beneath the flexor retinaculum in the wrist (1). Any condition that causes nerve compression or reduction within the relatively small area that defines the wrist can produce symptoms of CTS; obesity, diabetes mellitus, hypothyroidism, and pregnancy are among these risk factors (2-5). One of the anatomical features recently under consideration as an independent risk factor is the presence of the palmaris longus tendon. This tendon is congenitally absent in about 14% of the population, and this percentage varies by ethnicity (6). Although the palmaris longus passes over the flexor retinaculum, it may play a role in disease formation by pressing on the latter, so that individuals in whom this tendon is present have a greater chance of developing CTS (7, 8). Disputing this finding, at least one study found that presence or absence of the palmaris longus is not a factor in the development of CTS. Similar to palmaris longus tendon, absence of superficial fifth flexor digitorum tendon of the hand is a normal variation (9, 10), and its role has been evaluated as a possible factor in the formation of CTS (8, 11). The diagnosis of CTS is based on history taking, physical examination and paraclinical methods such as electrodiagnostic studies. The role of sonography in confirming the diagnosis of carpal tunnel syndrome by measuring the diameter of a cross-section of the median nerve was reported more than a decade ago (12-14). 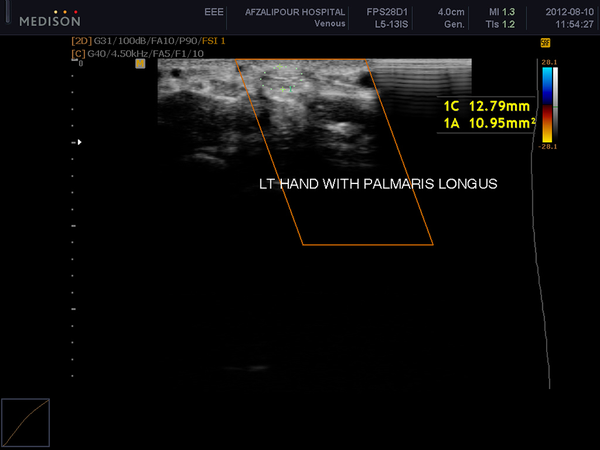 Considering the role of the palmaris longus tendon in developing CTS, it seems logical to assess the presence of this tendon during sonographic measurement of the cross sectional area of the median nerve. Recently, the effect of the palmaris longus tendon on median nerve function has been studied (15) and that there was no relation between these physiological structures. This study aims to evaluate the difference in the diameter of the cross-section of the median nerve in individuals with and without palmaris longus tendon. In addition, considering the probable effect of the function of the superficial flexor tendon of the fifth finger on the pathophysiology of CTS the relationship between the function of this tendon and the cross-section of the nerve was evaluated too. This study was designed as cross sectional and was carried out after approval of Kerman Neuroscience Research Center and after receiving a license from the ethics committee. The study was performed on 93 volunteers, who were referred to the radiology department of Kerman Afzalipuor Hospital for a reason other than an upper limb problem, between April and October 2010. Selection criteria for the study were the following: 18-45 years of age; no history of carpal tunnel surgery; no report of CTS symptoms; no history of risk factors for CTS such as diabetes mellitus and hypothyroidism. Because obesity and pregnancy have been mentioned as risk factors in CTS, obese individuals and pregnant women were also excluded from the study. Participants who met the criteria listed above were examined for presence of the palmaris longus tendon and for the function of the superficial flexor of the fifth finger. To establish the presence of the palmaris longus tendon, the participant was asked to bend the wrist and to bring together the tips of the first and fifth fingers. To determine the presence of the superficial flexor tendon of fifth finger, the first four fingers were held by the examiner and the participant was asked to bend the fifth finger from the proximal interphalangeal joint. If the participants were able to bend this joint to an angle of at least 90 degrees, the superficial flexor tendon of the fifth finger was present. Participants who were not able to bend their fifth finger were asked to bend their fourth and fifth fingers simultaneously; if they were able to bend the proximal interphalangeal joint in this position, a superficial flexor tendon of the fifth finger connected to the fourth finger was present. If the participant was not able to bend the fifth finger even in this position, the superficial flexor tendon of the fifth finger was absent. After these examinations, a sonographic evaluation of the cross-section of the median nerve was conducted for each participant according to the following protocol. The participant would sit in front of the sonographer, with the forearm placed on the table in a completely relaxed position, and the palm facing upwards in a null position. The cross-section of the median nerve was measured at the location of its entry into the canal at the pisiform level by means of a linear high-frequency probe (5-13 MHz). To avoid bias in intermediate results, the sonographer was not aware of the results of the physical examinations of the wrist and hand, and more subjects than the calculated sample size for participants were enrolled into the study to increase the number of hands without tendons. We used the sonography device Medison; Model: ACCUVIX V10. Measurement was performed at the entry of the carpal tunnel, while the pisiform and scaphoid bones were considered as landmarks (Figures 1 - 4). Sixteen wrists of the volunteers were examined by two sonographers to assess the interobserver and intraobserver variability of this measurement. The results were recorded and statistical analysis was performed by SPSS software (IBM SPSS Statistics for Windows, Version 20.0. Armonk, NY: IBM Corp.), using Chi square and independent sample T-Tests. A total of 93 individuals with an average age of 30 years were enrolled into the study; 41 were male (44%) and 52 female (55.9%). Data from 180 hands were gathered in the study. Ten participants (10.8%) lacked the palmaris longus tendon in the left hand and in eleven participants (12%) it was absent in the right hand; in 10 participants it was absent in both hands. This means that out of 186 hands, in 145 (78%), the palmaris longus tendon was present and in 41 (22%) it was missing. There was complete absence of the fifth superficial flexor digitorum tendon in the right hands of four participants (2.2%) and in the left hands of four participants (2.2%); consequently, the superficial flexor was absent in eight out of 186 hands (4.3%). The mean difference in the cross-sectional area of the median nerve, considering all hands together and without considering variations, was not significant between the right and left hands (t-test P = 0.66, r = 0.8). Considering each hand as a separate subject the difference between the cross-sectional area of the nerve in the hands with and without the palmaris longus tendon was significant (T-test P = 0.03), although the difference in the cross sectional area with respect to presence or absence of the fifth superficial flexor digitorum tendon of the fifth finger was not significant (P = 0.32). The difference in the diameter of the median cross-section between men and women was not significant too (P = 0.17) (Tables 1-3). With respect to the interobserver and intraobserver reliability of sonographic measurement of the median nerve, ICC (intraclass correlation coefficient) of 0.93 and 0.92 were calculated, respectively. The most important finding in the present study is the statistically significant difference between the cross-sectional area of the median nerve confirmed by sonography in hands with and without the palmaris longus tendon. In other words, this variable should be taken into account when evaluating whether the cross-sectional area of the median nerve reflects a normal state or not. To the best of our knowledge, this topic has not been studied. In contrast, there was no significant difference between the cross-sectional area of the nerve in hands with and without the fifth superficial flexor digitorum tendon. Two studies have suggested a probable role for the presence or absence of function in the fifth flexor in the development of CTS (8, 11). One of these concludes that CTS is not related to the presence or absence of the fifth flexor tendon (8), but the other suggested that its absence is a risk factor (11). The sampling method and definition of the absence of the superficial flexor were different in these two studies. The absence of the superficial flexor is almost always a physiological defect and not an anatomic one (9), so in other words the anatomy does not differ in these two cases, which may explain the results of the present study. Sonography has been employed as a noninvasive method for the diagnosis of carpal tunnel syndrome for a long time. Considering that edema of the nerve is a feature of CTS it follows that the cross-sectional area would be affected, but determining exactly what value is a threshold for CTS requires insight into the normal reference range of the diameter of the nerve, and this is a controversial issue. Different studies have suggested different values for the normal range: 8.5, 9 to 12 (16-18) and even 15 mm2 (19). In the present study, without consideration of different variables and as a customary rule, the normal range was considered as 8.70 ± 1.56. In practice, the difference between presence and absence of the tendon may be so insignificant that it would not interfere in the diagnosis of CTS by sonography, so this finding is not considered important. Indeed, 0.6 mm2 is so small a difference that the sonographer would have difficultly measuring it. It should be considered that respected research has found that if the cross-sectional area is more than 12 mm2, the subject is considered a patient and if less than 9 mm2, the subject is considered normal (20). With such a wide range, 0.6 mm2 would not be a significant indicator of normalcy or disease. Another result of the present study is that the difference between males and females with regard to the cross-sectional area of the median nerve was not significant. 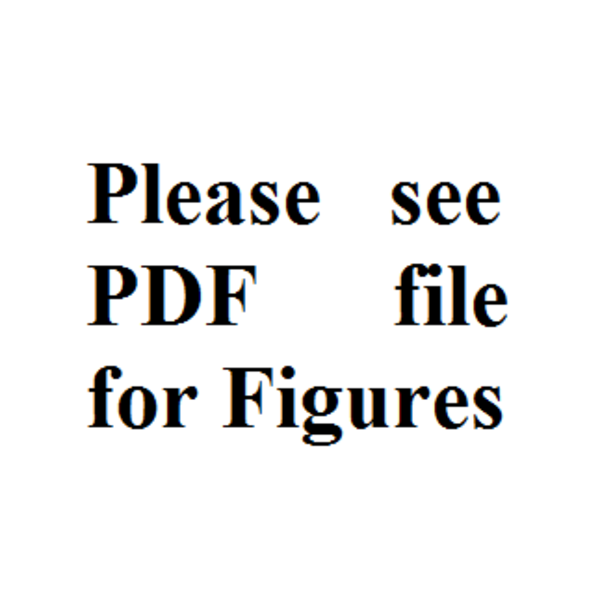 Regarding anatomical features, many anthropometric normal values such as height, weight, and chest and abdominal circumference are different between the two genders, but in some other anatomical measurements such as the medial clear space in ankle radiography the response is not straightforward. It is interesting that at least one study represents an answer to this question; according to its results, the amount of medial clear space in the ankle is significantly different between men and women (21). A study conducted in 2009 (22) found differences in wrist radiographic variables between men and women too. As we found no significant difference in the median nerve cross-section between the right and left hands, we took each hand as a separate subject and enrolled them into the study. Indeed, such a difference between the two sides is rare in biometrics and we can see similar results between the two sides (23), but is the opposite limb always a good reference of comparison in determining the normal value? One study on wrist radiographies concluded that radiography from the opposite wrist is a better point of reference than the values derived from the normal population (24). Another study concluded that for wrist radiography, some variables (carpal height, radiolunate, scapholunate, and capitolunate angles) support this statement and others (radial inclination, palmar tilt of the distal radius and ulnar variance) do not (25). Finally, in some other anatomic cases, such as the testes, the opposite side will not be a reliable reference because the two sides are not similar (26). The difference between median nerve cross-sectional area of the right and left side under sonography was not significant in this study. In other words, if the disease is unilateral, we will be able to use the opposite wrist as a reference for normal value. Of course, CTS is usually and almost always bilateral; consequently, this finding may not be applicable in practice (27). In the present study, only one sonographer was responsible for measurements of all participants, so conflict between the observers was not an issue. In fact many studies have shown that sonography has a high level of inter- and intra-observer reproducibility among the observers measuring median nerve cross-sectional area in the wrist, which is in agreement with our findings (28). Our present study had some shortcomings in that the height and weight of the participants was assumed to be normal and only obviously obese people were excluded from the study, while these variables themselves might affect the cross-sectional area of the nerve even in those selected. The second shortcoming is that the dominant hand was not taken into account, and there might be a difference between the dominant and non-dominant sides. Another consideration is that despite easy detection in most of the cases, sometimes determination of the presence or absence of the palmaris longus tendon is not a certainty, and determination error is probable, so to avoid this, we excluded cases in which there was any doubt. Considering the low incidence of an absent tendon in the population, further studies with a larger sample may be required in order to conduct a study with a substantial number of hands in which palmaris longus is absent. Finally, traditional sonography that measures the cross-sectional area of the nerve is not the only technology useful in diagnosing CTS nowadays, color Doppler sonography may be more useful in making a definitive diagnosis (29, 30), as the vascularity of the nerve increases in CTS. Future studies with a larger sample size will undoubtedly approve this method. According to the results of the current study, the median nerve cross-sectional area, as a sonographic measurement, is probably affected by the presence or absence of the palmaris longus tendon. Hands with a present tendon would demonstrate a greater cross-sectional area. These sonographic findings are not affected by the functionality or nonfunctionality of the fifth superficial flexor digitorum. So no correlation between CTS and the presence of palmaris longus tendon should be observed. The authors wish to declare their maximum gratitude towards the patients who entered this research for nothing else than cooperation and kindness.